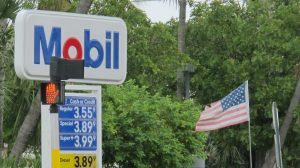 The heat may linger, but gas prices are beginning to fall further from their summer highs as the back-to-school rush gets into full swing. That good news has been noticeable in nearly every region of the United States, as the cost of a gallon of regular unleaded dropped between 6¢ and 11¢ per gallon, with the biggest relief felt across the Midwest, where the summer started with a torrent of price hikes to match the torrent of bad weather in May. New England and California, where prices usually are higher than the U.S. average, enjoyed smaller declines in the cost of gas, with people from Maine to Massachusetts paying about 3¢ less per gallon and West Coast drivers paying about 4¢ less. Drivers in the Rocky Mountain states did not witness a decline in fuel prices, and some even felt a tighter grip by the pump this week. 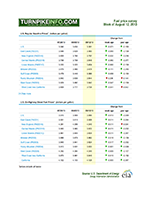 Across the region, prices remained mostly flat, although some stations raised prices by a penny or two. The Rocky Mountain region and California are the only two areas of the U.S. where prices are currently higher than they were last year at this time. Prices across the Rockies are up more than 14¢ per gallon versus their 2012 levels; California prices are up about 4¢. Aside from a brief mid-summer drop, gas prices have not been at their current levels since the start of May. For the most of rest of the country, prices this week are down from 2012 numbers by between 10¢ and 15¢ per gallon, although drivers across the Midwestern states are enjoying prices over 30¢ below this time last year. Gas prices, overall have not been this low since a dip in prices in early-July, which lasted less than two weeks. Prior to that, prices were last at this level in the weeks just before the Memorial Day holiday. Truckers and other drivers of diesel trucks and cars enjoyed a slight drop in the price of fuel, but the weekly declines were not nearly as noticeable as for regular fuels. The average diesel driver enjoyed about a penny’s worth of relief at the per gallon level. However, like regular gas, the year-over-year numbers are more satisfying. 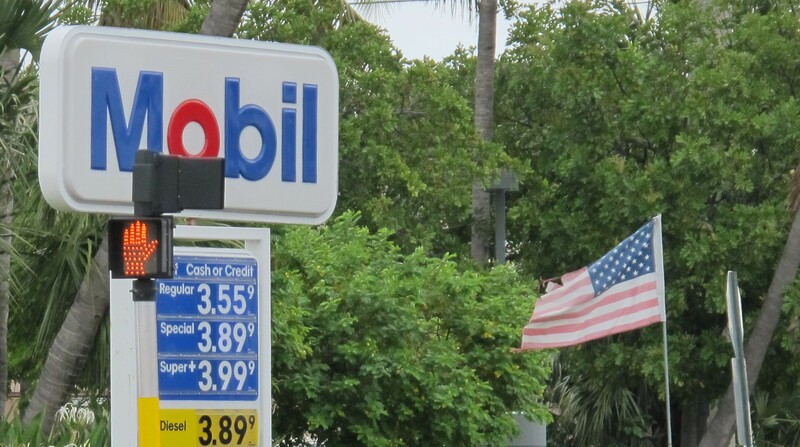 The average U.S. price of a gallon of diesel is down about 7¢ from this time in 2012.